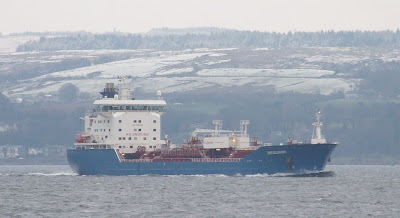 Against a backdrop of light snow, the Swedish tanker BRO DELIVERER sailed this morning for Avonmouth, with a cargo of petroleum products back-loaded from the former BP refinery at Grangemouth. A sister of BRO DEVELOPER, which has been seen here previously, she too is a 14,766 tonne deadweight ship capable of carrying not only clean or dirty oils, but also a wide range of chemicals in her 14 cargo tanks. BRO DELIVERER was launched at the Jinling Shipyard in China in June 2005, and completed the following April. She carries a full Scandinavian crew.